With support from Caritas Asia, Caritas Mongolia started the journey of popularizing organic agriculture. The saying goes in Mongolia that ‘meat for people and vegetables for animals’. Growing grains and vegetables is not the main profession of Mongolians and not even a priority for them. The nomadic people prefer keeping herds and love to eat meat. The number of animals is much higher than the number of humans. The cultivation season in the summer is from the end of May to August and altogether hardly lasts 100 days. The land is not suitable to grow vegetables unless the soil is improved. More importantly very few people are farmers. There is less indigenous knowledge of cultivation. There was a half-hearted effort to promote and preserve agricultural knowledge to produce potatoes, carrots, cucumber and some leafy vegetables in Mongolia from the 1960s. It wasn’t popular. Potatoes and cucumber were OK – with meat. Leafy vegetables are yet to grace the Mongolian dining table. So vegetables are scarce, thought to be expensive, nobody knows how to process them, and are unpopular. Caritas Mongolia is one of twelve implementing partners of Caritas Asia’s Sustainable Agriculture and Farmers’ Rights (SAFaR Programme). It is a small initiative to promote organic agriculture. It has lead to Caritas implementing an EU supported programme for the coming three years to ensure food sovereignty in Mongolia. Caritas Mongolia has been sending 1 staff and 2 farmers each year to the Southeast Asia level Farmers’ Conferences of Caritas Asia. Caritas Mongolia also has been sending staff to the Programme Officers’ Training on Climate Change and on Organic Agriculture. 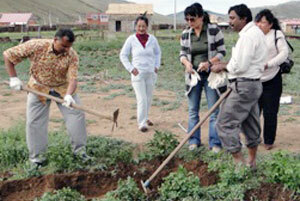 With financial support from Caritas Asia, Caritas Mongolia started the journey of popularizing organic agriculture. Caritas Mongolia organised several one or two-day workshops for the farmers on organic agriculture focusing mainly on ‘soil-improvement and creating good-fertile-soil’, ‘organic fertilizer and pest-replant making’, and ‘utilizing the limited time for agriculture’. At the very beginning there were farmers-selected-demonstration plots where farmers produced potatoes, cabbages, cucumbers. Produce was shared among the farmers and some of which were sold in the market to continue the efforts. Ms. Ayurzana Oyunchimeg was a pharmacist. She is a devoted farmer now. She sells her organic produces in the local market in summer. She stores her produces for winter and maintains green-house for the vegetables. Fr. Pierrot Kasemuana, a CICM Missionary, and his team are trying to promote organic agriculture and tree plantation throughout the country. Their other concern is to manage and ensure optimum utilization of water that Mongolia has. Fr. Pierrot has built very good relationship with the government. Together they are trying jointly to promote organic agriculture and tree planting. He has got two big plots of land from the government to establish demonstration-plots on organic agriculture. One is in Ulaanbaatar and the other one is 1000 km away of from the capital at Gobi Altai. Gabriel Baroi, the Programme Officer of Caritas Asia and Dr. Haridas V. Raman, the Manager of Natural Resource Management of Caritas India and the Regional Coordinator for SAFaR Programme visited Caritas Mongolia from 28 July to 7 August 2010. They focused on climate change, organic agriculture, water management, soil fertility by demonstrating different organic solution and compost making to improve soil and drive-away pests from plants. Caritas Asia included Mongolia in its SAFaR Programme to empower Caritas Mongolia. Now time has come that Caritas Mongolia is empowering Mongolians. With the active support and help of Caritas France (Secours Catholique), Caritas Mongolia has got into the funding channel of European Union. Caritas Mongolia sees and needs greater support, cooperation, capacity building programmes not only from Caritas Asia but also from other funding partners to empower Mongolian to face all the present day challenges. The sun will rise in Mongolia when it will use all its potential to supply potatoes and many other vegetables to its whole population and many other countries.